Ask any developer, and regular expressions are likely to appear near the top of the list of programming concepts he or she loves to hate. Used to describe complex queries that can be used to find and replace text, regular expressions can be extremely powerful, but also hard to grasp due to an obscure syntax and sometimes counterintuitive functionality. RegExRX 1.8.1 (Mac App Store link) attempts to cut through some of the complexity by providing users with an environment in which they can build regular expressions and execute them against arbitrary blocks of text. While you still need to know regular expressions in order to use this app, its editing environment gives you quick access to a catalog of every possible command, thus allowing you quickly compose long expressions and then run them against text of your choosing. To make things even easier, you can create your own templates, which can be quickly recalled from a convenient menu. After performing a search, the app shows all the results in a neat table; to make ensuring that you’ve found the right text easy, each item is linked to its location inside the source text. You can then either perform a search-and-replace operation, or you can export the text snippets you extracted to a text file, Excel document, or XML file compatible with FileMaker Pro. 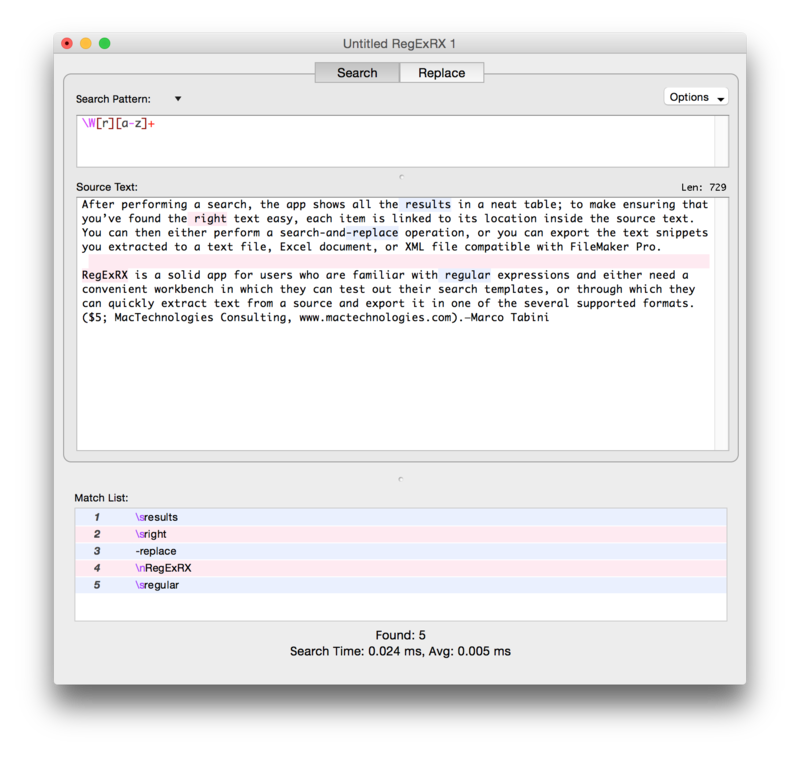 RegExRX is a solid app for users who are familiar with regular expressions and either need a convenient workbench in which they can test out their search templates, or through which they can quickly extract text from a source and export it in one of the several supported formats.